A note: San Francisco doesn’t automatically send kids to neighborhood schools, so most of those who don’t get to school by school bus are driven there by parents or others, even in the upper elementary grades. This year, the start of the school day has been moved up 10 minutes, to 7:50. Here’s the quiz: If those kids were habitually five minutes late when the day started at 8, how many minutes late will they be now that school starts at 7:50? In honor of Rembrandt’s 407th birthday, here are all the references I have made to him in my writing. Or at least all of them that I could remember or find. All of this is from the Salon column. They’re s’mores, is all they are. A little circle of graham cracker with marshmallow on it, surrounded, smothered — no, embraced — by a slightly brittle shell of dark, luscious chocolate. Enrobed. That’s the word. The chocolate is poured over the cookie, you see. The cookie isn’t dipped into the chocolate like some common thing. Therefore, says Nabisco, “Mallomars are an enrobed product.” They’re just s’mores, like you make at cookouts. And a Rembrandt’s just a painting, like you make in kindergarten. My grandmother loved this story, a love letter to Mallomars, which my grandfather, who died in 1968, loved. I know that sounds silly. A Randy Johnson fastball equals a Rembrandt painting equals a Shakespeare sonnet equals a Kobe Bryant dunk. I can enjoy Rembrandt as much as the next guy. Love what he could do with a dead peacock. But if a tackle-breaking run through the secondary by a tailback gives me the same pleasure, fills me equally with wonder, inspires me in the same way that a Rembrandt painting does, what difference is there? Rembrandt was just as meaningless last Sept. 12 as Emmitt Smith was. A little strange on its own but I think it more or less makes sense in the context of the argument I was making. This was the first anniversary of 9/11, and there were some mini-controversies over sportsball people using words like “warrior” or phrases like “let’s roll” when talking about other sportsball people. Some people thought of this as insulting to the memory of the dead, or to soldiers then just launching a decade’s worth of post-9/11 wars. My point was that we couldn’t live in a state of heightened sensitivity and mourning forever, that we had to get back to our normal lives, which we were doing, and that was a victory. And part of our normal lives is watching and talking about sports, which are exactly as important as we let them be. On Sept. 12, 2001, they weren’t important at all, to anyone. A year later, they were important again—if we wanted them to be. And each of us is free to assign importance to a sporting event, according to our tastes and feelings, just as we are to a Rembrandt painting, which, without the importance we’ve given it as a society, is just colors splashed on a canvas. I wonder if Cubs fans, deep in their heart of hearts, really love this. The Cubs are losers again, beaten 9-6 by the Marlins Wednesday in Game 7 of the National League Championship Series. But they aren’t just losers. They are artists of loss, maestros of defeat. They are to losing what Jascha Heifetz was to the violin, what Rembrandt was to still lifes, what Jennifer Lopez is to overexposure. Readers and friends who were Cubs fans hated this, thought I didn’t understand the first thing about being a Cubs fan. I maintain to this day that it’s just about the truest thing I’ve ever written. And they’re playing the Braves, whom they beat last year, and who are to losing in October what Rembrandt was to painting faces. “They” were the Houston Astros, who did, in fact, beat the Braves in that series. But that doesn’t mean I was right. The preview was set up with a “they will win because” section for every team. I did pick the Astros to go to the World Series, though, and I was right about that. I had them beating the Angels. They lost to the White Sox. Are you more risk-averse than a 5th grader? The wife, the kids and I were watching the cute game show “Are You Smarter Than a 5th Grader?” and all of a sudden some kind of game theory/philosophy seminar broke out. 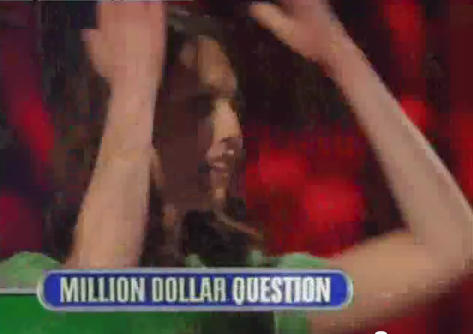 The contestant, a woman named Stephanie, had reached the final question, worth $1 million. She had earned $500,000 by correctly answering the previous question. If she got the million-dollar question wrong, she would walk away with $25,000. She could see the subject of the final question before deciding whether to answer it, and she could walk away at that point with the $500,000. But once she saw the question, she had to answer. The subject was music. Stephanie looked disappointed, but she also said she’d taken violin lessons for 10 years. She was 25 years old, I guessed and a post-show Google search confirmed. Her name is Stephanie Wambach. She’s from St. Louis, where the wife and I used to live—and which requires that I say she went to Marquette High School. And she went to the wife’s alma mater, Indiana University. This is all foreshadowing, in a kind of lame way. Here’s a clip of the last few minutes of the episode, uploaded to YouTube in 2007. Stephanie had mostly breezed through the answers, on questions ranging from second- to fifth-grade level, struggling only a little and using just one of her three “cheats.” “Fifth-grade level” makes these questions sound easier than they are. They’re not rocket science, but fifth-grade questions aren’t pushovers. If you’re not familiar with the subject, or don’t remember it from fifth grade, you’re sunk. One of the fifth-grade questions Stephanie had answered asked what country Sweden shared its longest border with. Now she thought over whether to go for the $1 million on the music question or “drop out” with $500,000. And there you have it. Two fundamentally different ways of looking at risk. The wife: How can you live with herself if you’d “given back” $475,000 by getting the last question wrong. Me: Any time I can bet $475,000 of house money to win $500,000, I’m putting the money down as if it weren’t mine—which it isn’t. I never really “had” dollars 25,001 through 500,000 any more than Stephanie “had” dollars 500,001 through 1 million. Get the last question wrong and the consolation prize would be $25,000. I’d live with myself just fine. I’d walk out thinking, “Losing stinks, but it was the right bet.” And if the same situation came up again, I’d do the same thing. Stephanie opted out. Interesting: A male person close to her had been in the audience the whole show holding up a sign that said “Go for the $1 million.” Is this a gender thing? Sample size of two so far. The guy, a friend, later wrote a blog post about it. Foxworthy asked Stephanie if she wanted to see the question and she quickly said, “No!” That followed from her first decision. She didn’t want to risk feeling terrible if she knew the answer, even though, given her decision, she must have thought there was a good chance she wouldn’t know the answer. Wouldn’t it have felt great to know she’d made the right call? I think that’s right. Even if her answer had been wrong. A development to the story we brought you about struggling families in Ohio who have been pushed over the edge by this recession. ††There’s been a response from people wanting to help. So it’s that old TV thing. NBC does a story on “Dateline” about families struggling through the recession in rural Ohio, and letters and donations and job offers come pouring in from all over the country. This is absolutely par for the course, it’s what happens every single time there is a sob story on the TV, but here’s the thing: People don’t care. They just respond to what’s on television. There are folks right down the street in Texas, California, Florida and Iowa who need food and basic supplies. There are good, capable people, some of them retired military, right down the street in Pennsylvania, Virginia, Arizona and Iowa who are looking for work. And after NBC’s report those people still need the basics and are still looking for work. And those people who sent the heartfelt letters and the donations and the job offers likely never moved a muscle for those people down the street. A guy who drove to the food pantry with a Hefty bag of donations tells the food pantry lady, “Cincinnati Ohio’s thinkin’ of ya,” and she gives him a big hug. Really, guy who drove 170 miles to Lottridge to find someone to give your Hefty bag of stuff to? Because where were you and the rest of Cincinnati before NBC aired its report? Waiting for food -- or a TV camera -- in Denver. Curry, who is among the best in the business and whom I don’t mean to beat up on, gets “a smile” out of this, as she should. She did a good piece about people who are struggling, her viewers responded in overwhelming fashion and the people she reported about are deeply moved by their good fortune. If you focus in tightly enough, it really is a wonderful thing. That relatively tiny group of people in Ohio actually did get a lot of help they weren’t going to get without that TV report. It was like a little miracle, and you’d have to have a hard heart indeed not to be touched by the young mom reading the letter or the hard-working food pantry lady who is suddenly able to provide so much more help to so many more people. I love America too. But back your view out to the larger picture and what you see is something much more depressing. Obviously, the people who sent money and goods and job offers had both the means and willingness to help their neighbors in need, but instead they helped some people they saw on TV. Now, I suppose it’s possible that every one of them, from the donor of $5,000 to the Hefty bag guy from Cincinnati to the job offerers in Pennsylvania, Virginia, Arizona and Iowa, are doing just as much for lots of other people closer to home and not on the TV. I would just be willing to bet a lot that they aren’t. What Curry’s story suggests is that the generosity of the American people can solve the problems of a lot of folks who need help — as long as they can get on TV. Getting on TV is a lottery ticket, and the depressing part of it is that if you’re in trouble, your chances of getting on TV are about the same as your chances of winning the lottery. What about all the desperate people who didn’t have a TV network drop out of the sky into their local food pantry? How do we turn their story into “a smile”? Because there are clearly people out there willing to help. There just isn’t enough TV to go around. Photo by Jeffrey Beall, Creative Commons license. Beau Dure, excellent USA Today soccer and mixed martial arts writer and longtime virtual friend of this typist, made some good points in a comment about my recent post Newspapers’ fatal error, which talked about the industry’s longtime failure to understand and engage with the Internet. And which wasn’t that recent. It’s been a busy week. That echoes a comment by another virtual friend, TVerik, a frequent poster at the Baseball Primer Newsblog, where the piece was linked to. First of all, papers that started blogging in 2003 were about eight years late to the game, and were simply tacking blogs on top of their print-newspaper-on-the-Web model. Just because Nando.net, which really was great in its day, didn’t make it doesn’t mean nobody could have made it. One valiant effort that ultimately failed does not mean that the entire industry would have failed had it turned its considerable brainpower to trying to figure out a model for this new medium. Part of Nando.net’s business, as I understand the history, was being an Internet service provider. That arm of it was later sold off. I don’t know enough about the ISP business — I figure “nothing” is not enough — to really say this, but it seems to me that was the business for newspapers to get into. Everyone who complains about readers who are unwilling to pay for content on the Web is missing the point that readers are paying for content on the Web. We pay our ISPs. Newspapers and other Web sites — like this one — might be giving away content, but we’re not giving it to readers. We’re giving it to ISPs. As a reader, I’m not getting the newspaper and everything else I read for free. I pay for my Internet service every month. Like a lot of people I read a lot on the Web while I’m at work — though it should be noted, especially by my bosses, that that’s part of my job and I never, ever read a single word on the clock that isn’t work related. So I don’t pay for what I read at work, but my company does. Someone does. Newspaper publishers are whining to the Senate and anywhere else someone will listen about how the Internet hasn’t provided and can’t provide a sustainable business model for journalism. But it has. ISPs are happily selling Internet access to those of us who want to see what’s on the Web, as well as get our e-mail and instant messages and share pirated movies. The newspapers are mostly giving away their journalism — to the ISPs — and that seems like an issue between the newspapers and the ISPs, not between the newspapers and us. But the newspapers have pretty much always given away the journalism. Back when you paid a quarter for your daily paper, you were buying the thing, the hunk of paper with ink marks on it, maybe a rubber band. You’re still buying the thing now, the Internet service. The newspapers got boxed out of the thing-selling business is what happened. Tough break, but maybe they should have been thinking about how to use this new medium rather than spending years attacking it as nothing more than a lair for pedophiles and basement-dwelling freaks. I don’t think it’s “20/20 hindsight” to place blame on the editorial side. The point of the piece was that I saw it coming, and I was a nobody with almost no experience. I agree the failure is probably just as great on the ad side. I just didn’t see it firsthand, so I don’t have much to say about it. To answer TVErik, papers wouldn’t necessarily have invented Craigslist, sure. Craigslist is a nonprofit. Why would papers invent something that makes no money to replace something that does? But newspapers could have invented something. If they’d come up with a version of classified advertising that wasn’t free but was significantly cheaper and better than the old print model, there might not have been the demand that led to Craigslist being invented. Then again, Craigslist might have happened anyway. I don’t know. We’ll never know what would have happened in the last 15 years if newspapers had been smart, will we? Obviously the Times decided to run the piece in the Magazine because the Mag is prestigious and the advertising in it is lucrative. From the Times’ perspective, a major interview with the president is a natural for the Magazine. Well, thanks for the interview, New York Times. It’s really, really good. We knuckle-draggers out here who don’t care about the indispensable role of newspapers in the functioning of our democracy would have liked seeing it three weeks ago. This is the kind of thing that might partially explain those falling readership numbers, don’t you think, Times? Repurposed from Facebook status updates! I’ve been telling this story a lot lately. It was July 1989 and I was on my first night on the San Francisco Examiner night copydesk, my first real professional job. The gig was to look in the “In basket” — a computer file named for an actual basket that used to sit on the copydesk when everything was done on paper — for stories with my name on them, copy edit them, write the headlines and captions, then move them into the cleverly named “Out basket.” The copy ebbed and flowed with deadlines, so there was some down time. I filled it by exploring on the computer. I could read the Associated Press wire and, if I recall, United Press International was still around. There was the Scripps-Howard wire and the Knight-Ridder wire and the Hearst wire. I was reading news and feature stories from all over the country and the world, full-length stories for every baseball game in the major leagues, columnists from the New York Times, Chicago Tribune, Miami Herald, Dallas Morning News and so on. Behind me three machines were spitting out several photos a minute, each, from around the globe. Guerrillas in Afghanistan, kids at Coney Island, President Bush at a Cabinet meeting, a play at second base in Milwaukee. For every picture that appeared in the paper, there must have been a thousand that didn’t. I’m not going to lie here. I didn’t envision the Internet. I didn’t see the Web coming. I’m not kicking myself for not founding Yahoo or something. But I could see that something was coming. I didn’t know exactly how this stuff worked, how those pictures got from Afghanistan to the machine behind me or the Mike Royko column got from Chicago to the green type on my black computer screen. But I was vaguely aware they came over phone lines of some sort. I had just learned about e-mail that summer while writing a story for the East Bay Express about Chinese students at Berkeley who were using every method at their disposal — including this e-mail doohickey that someone patiently explained to me, several times — to get news about the Tiananmen Square protests in to China, where those stories were being censored. And I was conscious of the speed of innovation. Just since adolescence, for example, I’d seen calculators, microwave ovens and VCRs go from practically nonexistent to monstrous novelties to much smaller everyday items. I’d seen computers go from room-sized things that technicians ran to desktop items high school kids typed papers and played games on. There was a computer on my desk in my apartment that wasn’t that different in size to the one at work, only it wasn’t hooked up to a mainframe that was in turn connected to the rest of the world. But I knew that in the future — and I knew it wasn’t the distant future — I’d be able to sit at home, in front of my own computer, and do what I was doing at work. Read the wires, read newspaper stories from all over the world. I spent a lot of time talking to friends — I was fresh out of J-school, so I had friends willing to talk about such things — about how in a few years we wouldn’t be stuck with our small group of local beat writers and columnists and movie critics. We’d be able to read anyone we wanted! Here’s something I didn’t think, though, while I was busy not envisioning the Internet. I didn’t think: Newspapers are doomed! I figured each individual paper would be thrilled at the chance to reach readers outside its delivery area. The Examiner and Chronicle were already trucking papers as far as they could go by morning, rushing to get them to Reno and Fresno and Chico and maybe even farther than that. Why wouldn’t they jump at the chance to get the product to people in Seattle and Philadelphia and Mexico City? In other words, I assumed newspapers would adjust, adapt. Most of the country’s major papers, including the Examiner, were more than a century old. I figured they’d rolled with a few massive changes over the years. I was sitting at a computer, not a typewriter. The paper was pasted up and photographed — already becoming an antiquated method by 1989, though I didn’t know that — not set on Linotype machines as it had been a few years before. It seemed to me that newspapers were OK with technology and change. It was my first night on the job. I hadn’t yet learned how hidebound, how slow, how downright stupid newspaper management could be. The Web came along as a medium to be reckoned with about five years later. As an industry, newspapers failed to see it as an opportunity and instead treated it, almost unanimously, as a threat, something to be fought and vanquished. It was a mistake the industry made not for weeks or months, but for years. It was the newspaper industry’s fatal error. The way the kids say it now: its epic fail. A few bonehead moves? How about a consistent, industry-wide pattern of ignorance and fear that produced what might as well have been a coordinated smear campaign. Almost every story about the Internet in the mid-’90s was about how it was awash in pedophiles and other predators. And maybe I’m getting a little Psych 101 here, but what the newspaper was really afraid of wasn’t so much the Internet as a technological thing, it was the way it brought the readership closer. Oh, man: Not the readers! Here’s Bronstein again, telling the Washington Post’s Howard Kurtz that “the public was seen as kind of messy and icky and not something you needed to get involved with.” Note the third-person, passive-voice construction there, as though this were some sort of natural occurrence, not a colossal blunder by Bronstein and almost everyone in similar jobs. The crops were destroyed by drought. The public was seen as kind of messy. Scott Rosenberg, who also worked at the Examiner, recently told me that he wanted to put his e-mail address on his newspaper stories way back when, but Bronstein told him, “You can’t do that.” If he did, people would write him, and he’d have to respond. Egad! I’m picking on Phil here, but I’ve heard and read enough stories from all over to know that he was simply representative, of the Examiner, of Hearst, of the entire industry. You hear a lot about how eBay, Craigslist, Google and others killed newspapers. The Internet killed the classified business, a major bulwark of newspaper revenue, the story goes. But there’s no reason Craigslist, for example, couldn’t have been invented by a newspaper. No reason except newspapers’ years-long refusal to compete on this new playing field. Instead they grudgingly shoveled the newspaper online. And I mean really, shoveled it. In the ’90s — a long time ago but still way too late in the game for this — on some newspaper Web sites you used to see print business in the stories online. “Please see Page 12, column 1,” it might say, right in the middle of a story, followed on the next line by “Continued from Page 1.” They were so contemptuous of the Web they didn’t even bother to have a copy person re-code the stories. In the last few years most newspaper Web sites have added a few blogs and photo galleries and such, but they’re still essentially the newspaper, online. Even the newspapers that have shut the print operation are still doing it. The Internet-only Seattle P-I is pretty much the Seattle P-I, just online. Didn’t the Seattle P-I get the message that what it was doing wasn’t working? The crisis in newspapers, and especially the decision to move online only by individual newspapers, has been a perfect opportunity for them to reinvent themselves, to redefine what a newspaper is and how it performs its core mission of informing the public and acting as a watchdog on our institutions. That’s something newspapers should have been doing all along, just as they had been doing, in much slower motion, for most of their history. A newspaper in 1990 was a very different animal than the same newspaper in, say, 1920 precisely because newspapers had changed and adapted with the times. But when the change sped up, the newspaper industry responded by displaying an astonishing lack of imagination and creativity, instead lashing out at the Internet, warning readers to stay away from it, practically lighting torches. They’ve put the torches away by now, but the response is largely the same to this day, a dogged refusal to truly engage with the way their world now works. In related news, the chief executive officer of the National Buggy Whip Company said his firm’s strong showing in the 2009 Buggy Whip Awards proves the continued viability and relevance of buggy whips. “I don’t think they’d be handing out awards like that if our product wasn’t still extremely important,” said Chester Heidecker of NBWC, whose Giddyap 5000 won Buggy Whip of the Year. The company also took home the prize for best innovation (NFL logos on the handle) and Most Ergonomic Whip.